I haven't been able to finish a Robbins since Still Life. But I keep trying. I begin to forget why. 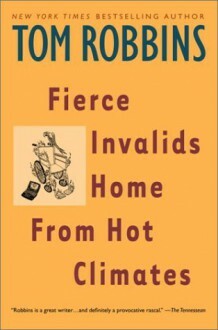 FINALLY finished.You know, sometimes Tom Robbins' writing is just too damn' quirky to stand. Like, quirky interspersed with deep. Every. Single. Book. Apparently I wasn't much in the mood for it lately, since it took the better part of a month to get thru it. this guy's interesting. he brings up so many important topics throughout the novel. his quirkiness is welcome here, not over the top, like i thought it was in even cowgirls get the blues. obviously i'm not thrilled with his treatment of pedophilia, but other than that this book was great fun.